Earth Day, when environmental conservation is in the national spotlight, is generally considered an ideal time to educate people of all ages about the need to reduce, reuse and recycle. Really, though, this educational process can begin at any time and at any age. While “conservation” is a big word young children may not yet have the perspective to fully comprehend, parents and teachers can help children build toward a complete understanding. 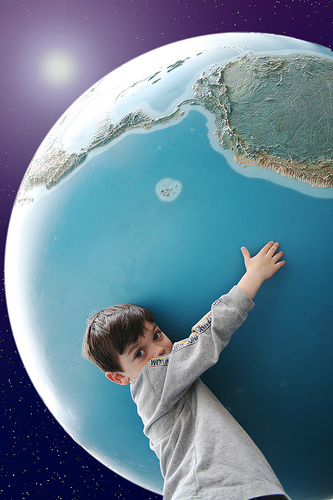 Making a few simple activities part of your family’s daily routine will help your child begin to identify with size of the Earth and the fact that we are all responsible for its well-being. Speak in terms they will understand. The idea of saving the planet can be daunting, especially when your concept of the world is limited primarily to your home, child care facility and local community. A good place to start is to talk about what it is to litter and how being careful about where you leave trash can help your immediate environments. There’s a funny but enlightening poem in Shel Silverstein’s book, Where the Sidewalk Ends, called “Sarah Cynthia Sylvia Stout Would Not Take the Garbage Out” that graphically illustrates the issue of garbage disposal. Recycle at home and in public when possible. Have your child sort the bottles and cans and place them in the appropriate bin. Teach them what it means to save. Explain that just because you have a large supply of something doesn’t mean it’s a good idea to use it all immediately. Remind your child to only take what he or she needs or can use at one time whether its food, paper or glue. For example, with glue, teach them to say, “one dot will do it!” so they learn not to use the glue bottle dry. Also, when they color and are ready to throw away a picture they don’t like, show them how they can turn the paper over and use the other side or change the part of the picture they don’t like. When given a pad of paper, children sometimes think they need to fill it up in a hurry with a small mark on each page. Start a book of pictures of yourself and show them that a pad is a good way to collect pictures and show much fun it is to go back and look at them. Add the date to each page and you’ll be introducing them to how to keep a journal. Don’t be an energy hog. The Alliance to Save Energy has a wonderful character called the Energy Hog that helps children understand which household appliances consume a great deal of energy. Energy Hog will teach your child to identify other potential energy hogs in your home. The overall message is that it’s important to know how to use less energy and to practice energy saving habits like turning off lights and keeping exterior doors closed. Make conservation an activity and it will become a way of thinking. Earth Day may be celebrated only once a year, but daily routines practiced all year round will foster your child’s understanding of conservation. Here are a few simple actions you can do at home that will teach your children how to conserve resources. Turn the lights off every time you leave a room. Always turn the faucet off while brushing your teeth. Take reusable shopping bags when you go to the grocery store. When your child outgrows his or her clothes, make a quilt as a way to recycle fabric. It will also be a special keepsake later in life. Unplug your cell phone charger, hair dryer and any other items when these items are not in use. In all your conservation efforts, emphasize the impact their actions will have on the community, which is part of the bigger world. This way you will help them understand that every effort, even if it seems small, can make a difference. The Best Organic Strawberry Tart Ever! Boys And Girls: As Different as Cats and Dogs? Hank D and the Bee: Hank Stops the Oil Leak! Tell the USDA not to approve new GMO, 2,4-D-resistant crops and stop the tide of toxins being dumped on our food.